Like Damon Hill, Jacques Villeneuve is another second-generation Grand Prix driver who escaped the long shadow of a famous father, Gilles, to become World Champion through his own efforts and on his own terms. He claims he was always going to follow in his father's footsteps, though Jacques was just 11 years old when Gilles was killed in 1982. Brought up in Monaco rather than his native Canada, Villeneuve has been guided from the beginning by Craig Pollock, his former sports master at school. After an initial foray in saloon cars, Villeneuve learned his craft in F3 in Italy and Japan before moving Stateside and the American Formula Atlantic championship. This campaign was backed by Players cigarettes, which helped his graduation to Indycars in 1994. A promising season was followed by a superb one in 1995 as he took victory in the Indianapolis 500 as well as the Indycar championship. This, together with the desire by F1 supremo Bernie Ecclestone to see an 'American' driver in F1, eased him straight into the top Grand Prix team in the business for 1996. After putting his Williams on pole position for his F1 debut, Villeneuve scored three wins and took the championship battle with teammate Damon Hill down to the wire. At Estoril he also earned the ultimate respect of the F1 world by doing the unthinkable - passing Michael Schumacher round the outside. Credentials thus established, Villeneuve headed into 1997 looking to go one better than his '96 runner-up position. After beginning the year strongly, he suffered some midseason 'wobbles' - crashing out of the lead in Canada through pure driving error, being off the pace in both France and Germany - which was all the inspired Schumacher needed to take the lead of the series. A strong fight back by Williams and Villeneuve looked like reaping its reward though, until the penultimate round in Japan where Villeneuve was suspended for a practice yellow flag infringement - his fourth of the season - and Schumacher won. All of which left Villeneuve virtually neck and neck with the German for a dramatic showdown at Jerez for the European Grand Prix. Though Schumacher made the early running, after both drivers had made their routine stops, Jacques began to hunt the Ferrari down. Once it was in his sights he decided to surprise Schumacher by diving for the inside from a long way back. It was a beautiful move and Schumacher indeed was surprised. When he realized his error he turned into the Williams but succeeded only in putting himself into the gravel trap and out of the race. Villeneuve continued in the lead and on the last lap allowed the McLarens of Hakkinen and Coulthard to overtake him. His championship was thus secure, and had been won the hard way. That was the high point of VilleneuveÕs F1 career. The 1998 season was less successful. Villeneuve scored no wins but was still fifth in the World Championship and at the end of the year he left the team and moved to join the new British American Racing. The team was not a success but Villeneuve stayed despite a lack of decent results which ultimately led to the departure of team boss Craig Pollock and his replacement by David Richards. Richards was unhappy with the hug salary to which Villeneuve had a contractual claim for 2003 but there was little choice and the pair entered the season in a marriage of convenience.Villeneuve left before the end of the year when it became clear he would not get a drive in 2004. He sat out most of the following season before being called back to F1 by Renault for the final races of the year, replacing Jarno Trulli. He moved to Sauber in 2005 but struggled for most of the year and was lucky to have a contract for 2006 which BMW decided to honour when it took over the team. The relationship did not last long with Villeneuve leaving in the mid-season to be replaced by Robert Kubica. 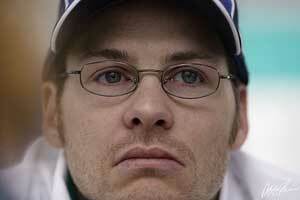 Villeneuve then tried to get a deal to race in NASCAR.